The National Park Service is conducting an Expanded Non-Native Aquatic Species Management Plan Environmental Assessment (EA) that includes elements having a potentially damaging impact on the Lees Ferry trout fishery and the business and guide services dependent on that fishery. Submitting your comments is the only way to protect and support the fishery. Comments are due by 1/5/18. Please share this with all your angling friends! The EA proposes electrofishing mechanical removal of brown trout in Lees Ferry/ Glen Canyon with "long-term, intensive and repeated electrofishing." Collateral damage to the rainbow trout fishery from mechanical removal on the proposed massive scale will be unavoidable. Rainbow trout not removed at the time of brown trout removal will be intensely and repeatedly shocked as the electrofishing process progresses along the river and continues over recurring lengthy periods of time. Surviving rainbow trout, while recovering, would be unfishable for extended periods. This action would have a catastrophic impact on the quality of the Lee Ferry trout fishery, the welfare of the local community, and the regional economic benefits tied to the fishery. We strongly oppose this action and urge you to do the same by commenting to the National Park Service that you oppose any mechanical removal of brown trout at Lees Ferry PERIOD! Comments submitted! It is totally unrealistic to think the Brown Trout can be removed by electroshocking the Colorado river! Many of the fish in the river will be negatively affected and we will spend a bunch of money in an unsuccessful attempt! Comments submitted! Please make sure that everyone takes this opportunity to share your thoughts. Electroshocking for Browns has had a direct and negative impact on the Rainbows and native species. I have the photos to prove it. This is a lose/lose plan for Lee’s Ferry if the Park Service gets their way. Time to rise up here folks! I don't exaggerate...I just remember BIG ! Does this mean they will electroshock me too when I take my daily river dunk and become a temporary non-native aquatic species? Last edited by Litespeed1; 12-20-2017 at 08:21 AM. I am a US citizen, a voter, a business owner, and a taxpayer. I am also a fisherman - and have been fishing Arizona since 1971. 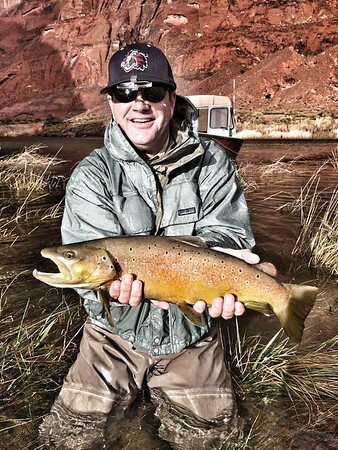 The section of the Colorado River below Glen Canyon Dam known as Lees Ferry is a quality trout fishery. I want my tax dollars spent on maintaining and improving that fishery. I do not -- repeat not -- want my tax dollars spent on destroying or damaging that fishery in any way. I am opposed to any plan that involves forced removal of brown trout from the section of the Colorado River below Glen Canyon Dam known as Lees Ferry. I am not in favor of the government spending tax dollars trying to eradicate brown trout or any fish for that matter from the Colorado river below Glenn Canyon Dam. By building the dam, the ecosystem has been altered to the point where the survival of native fish is unobtainable in the vast majority of that watershed. It would also be impossible to eradicate brown trout utilizing the methods that are mentioned, or with any current technology. If the plan is to spend hundreds of millions to billions of dollars suppressing brown trout and other species until the end of humanity only to have them take over whenever we are gone or, until the dam comes down allowing the warm water to kill them off, I'm not in favor of it. And if the plan is to just spend a few million dollars over a couple years to suppress the brown trout and then allow them to repopulate a few years later, that doesn't sound fiscally responsible either. Furthermore, you (NPS) want to increase park fees to update the aging facilities, and yet you plan on spending millions to fight a losing battle against fish? Keep the public responses coming. Share with fellow friends and family who care to someday share home waters with future fisherman and women. I'm completely against the idea of states having control over federal land which we all know is a very relevant political topic. But with that being said this would be one of the few scenario's I can think of we would be better off with the state managing Lee's Ferry.